Gleaming after a fresh paint job, Leander makes her way to the water on the synchrolift. In the life of any yacht that has been classed by one of the specialist class societies such as Lloyds (LR), Bureau Veritas (BV) or the American Bureau of Shipping (ABS), there are times when it has to come out of the water for a full check-up. These are made at five-year intervals and they are a complex business. To gain an insight into what is involved, we were pleased to accept an invitation from Sir Donald Gosling to visit his 1,930GT motor yacht Leander, as she reached the end of a Lloyds class survey. 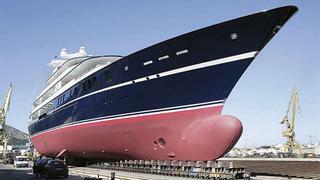 The survey and associated work had been carried out at the Navantia yard in Cartagena, Spain. This yard usually maintains the Spanish Navy, but it also undertakes a certain amount of commercial and yacht work. It has excellent facilities, including a 5,000 tonne lift and a recently built shed equipped for painting. Leander had been slipped there several times in the past and both her crew and managers appreciate working with a large organisation with full engineering backup, as this enables the yard to solve most problems in-house and thus accelerate the work rate dramatically when the pressure is on. Launched in Germany in 1993, Leander was 15 years old at the time of this survey, and she was due for a certain amount of modernisation in addition to the survey requirements. During a yard visit such as this, many tasks will run simultaneously, and not all of these will be part of the survey. For a start, there are numerous requirements that are the responsibility of the flag state (in this case Bermuda), most of which come down from the International Maritime Organization (IMO). During a yard visit such as this, many tasks will run simultaneously, and not all of these will be part of the survey. Whilst out of the water, work included replacing a worn cutlass bearing. The IMO, for instance, dictates what kind of life-saving equipment each class of ship has to carry. Because Leander is registered as a commercial yacht (one that is licensed for charter operations) her flag state has issued an appropriate quantitive requirement for safety equipment. Checking that all the safety equipment is on board and that all its servicing and paperwork is up to date is thus a flag state responsibility, although the state can decide whether to send its own surveyor to check this or delegate this task to Lloyds. In this case Bermuda has a full-time surveyor covering the Mediterranean, and he visited Leander in person to check and sign-off her safety equipment, her International Safety Management (ISM) status, and International Ship and Port Security (ISPS) compliances that are required by the IMO. But some of the other IMO requirements had been delegated to Lloyds. Leanders crew had also come up with suggestions for other work that was unconnected with the survey, but could be conveniently tackled at the same time. The 27 crew can all submit their ideas for updates and improvements to the yachts full-time manager John Evens, who compiles a list and discusses the proposals with the owner, who has the unenviable task of deciding how much money he wants to spend. Everything to do with safety is accepted automatically, Sir Donald tells us, Then we look at maintenance and upkeep issues, such as painting or replacing worn furnishings, and finally at replacing the yachts toys. A slot had been reserved at Navantia and the work list finalised well in advance. The yards commercial manager, Antonio Sánchez had previously visited Leander in Palma to discuss the work list and quotations. In September, at the end of the Mediterranean season, Leander made her way to Cartagena where she was lifted out of the water by the yards synchrolift and readied for the survey work to begin. Shore accommodation had already been booked for the crew  some of whom took time off, while others remained throughout the refit to work aboard. The yard had appointed a project manager and assistant who faced the tremendous task of scheduling all the work, but the first days belonged to Lloyds.